When the Nation chose to be content with GI pipes for their water needs, we were compelled in our spirit to stand out and so was the water revolution born in the year 1957 with the first Thermoplastic technology. 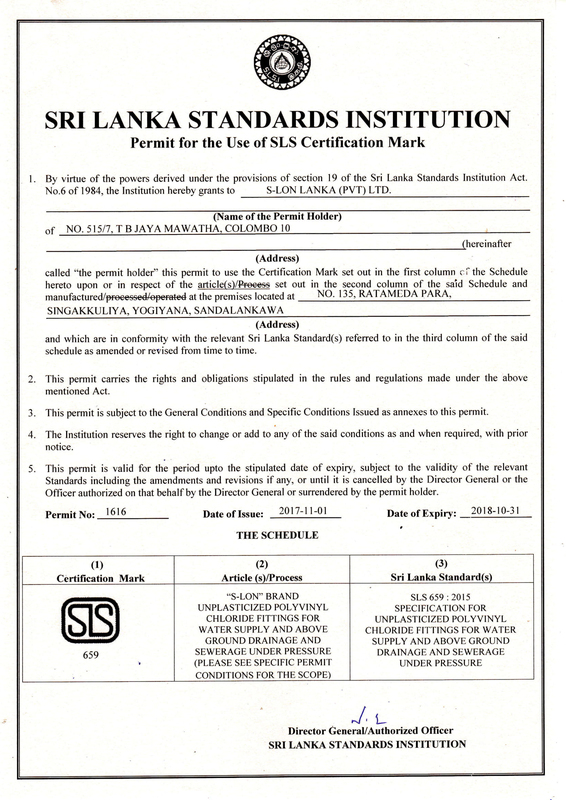 S-lon Lanka (Pvt) Ltd, a subsidiary of the Capital Maharaja Organisation Ltd, (TCMOL) which pioneered Thermoplastic pipes in Sri Lanka operated directly under the financial support of the parent company under the industrial division since 1957, ventured into independent operations in 1987. Brand ‘S-lon’ had its origins in Japan by a company named Shikushi which was rejuvenated in 1957 by TCMOL. 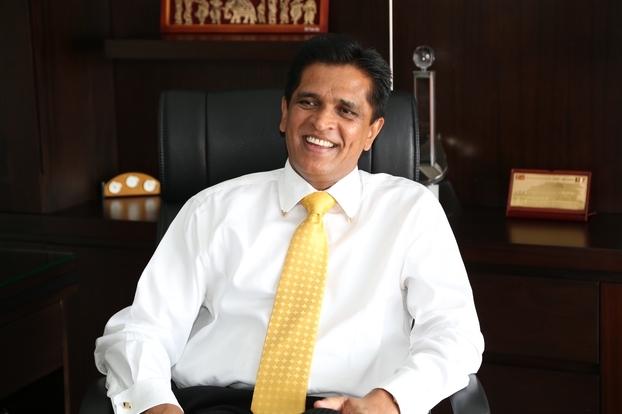 Having successfully introduced PVC to the market, in-house production commenced in 1958 through its factory which was situated in Ratmalana, with the need to upgrade technology and to meet the ever increasing demand, the factory was shifted to a 10 acre land in Singakkuliya, Pannala. Today, S-lon plays a pivotal role in the development of the nation at large. Being part of a country rooted with a captivating heritage and warm Sri Lankan hospitality, S-lon has touched the lives of Sri Lankans throughout the island for over six decades. S-lon had been a part of some of our Nation’s most significant and prestigious construction projects to date. Amongst many successful projects in its 60 year journey, S-lon continued to be the preferred choice amongst some of the latest projects that caught fame. Colombo Racecourse, Independence Arcade, On Three 20 apartment complex, The Sands, Waskaduwa, Chaaya Bey, Hikkaduwa, the Defense Headquarters at Akuregoda, and the newly rehabilitated Jaffna Railway Station. 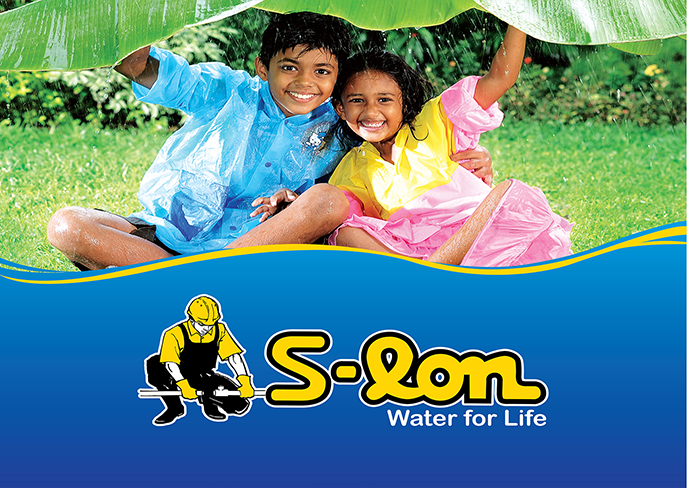 Today, S-lon manufactures and distributes a diverse portfolio of water management solutions that include a comprehensive range of pipes and fittings, rain water disposable systems, sewage pipes & fittings, hot water piping system, ball valves, ABS taps and water pumps. We have taken our expertise and gone a step further to provide solvent cement, garden mesh, chrome plated faucets & accessories and roofing sheets. As the pioneer and market leader in facilitating the Nation’s need for water uninterruptedly for over 60 years, our ‘Brand Promise’ is water for life and clean water is good health in which we plan to build a healthier nation as the driving force of the country. In the process we wish to provide the Nation with a complete and comprehensive range of products and accessories, manufactured using future technology to deliver clean potable water. We ensure the durability and long life of all our products whilst reinforcing our trust amongst our loyal customers and commitment to preserve water by preserving nature and the environment. ‘Water for life’ is therefore the essence of our brand – it is our pledge to you. S-lon aspires to be the most preferred solution provider to satisfy the needs of building construction and water management industries. group director - the capital maharaja organisation limited. From the beginning over 60 years ago, we have always had an unprecedented passion towards excellence, capturing the attention of Engineers, Architects, Plumbers and Home Builders, creating what was a revolution in water management systems in terms of efficiency and overall costs. 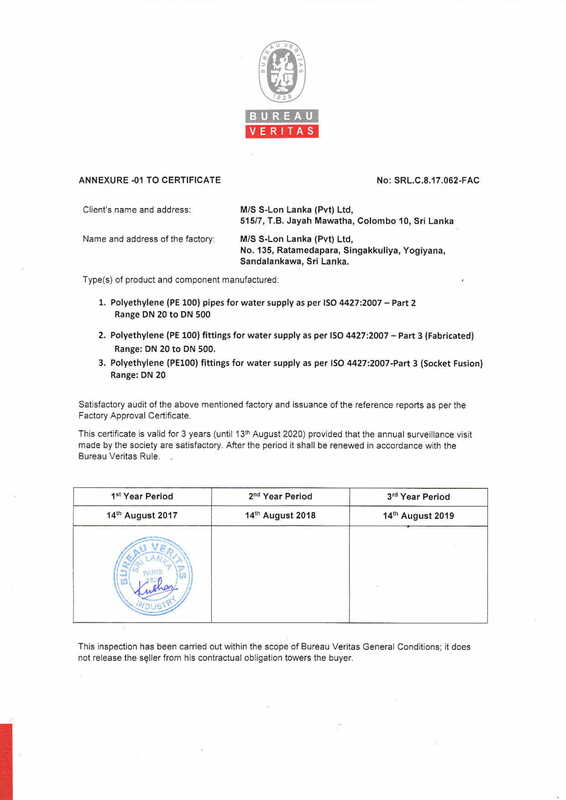 Today, with our dedication to preserve water, we have had the hearts and minds of Sri Lankans across the island in our journey to be the country’s largest producer of Thermoplastic pipes, giving S-lon the prestigious status of being a brand name that is synonymous with PVC pipes in Sri Lanka. We make it our mission to do our best, to become a conduit of excellence and quality, from end to end, to preserve water through our extensive product range and our state of the art manufacturing plant, doing our best to serve the Nation. In keeping with this promise, we firmly believe that we should provide our valuable customers nothing but the best. Our success at S-lon is driven by our enthusiastic people and our commitment to preserve water coupled with our burning desire to offer the best. We do things the right way by operating responsibly, executing with excellence and applying innovative technology wherever possible. We constantly look forward by analyzing our skills and expertise to seize new opportunities, bringing benefit whenever possible to society by preserving our limited resources of water, for life. While the S-lon brand has long been associated with high grade, high performance Water management systems and the company has a long history of introducing a diverse range of innovative products. 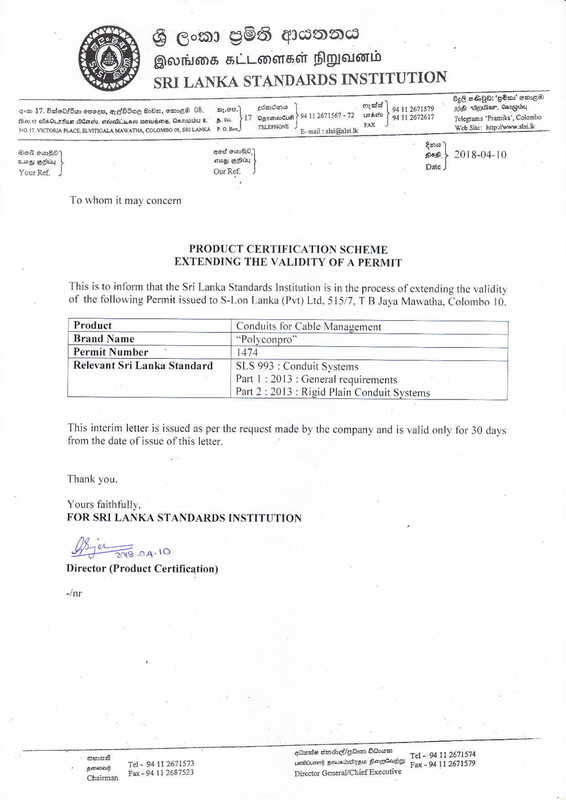 PE+ Water tanks, Kevilton electrical switches, Tuffline packaging and FMCG products by ICL are some of the renowned brands initiated by S-lon Lanka. As the pre-eminent manufacturer of water management systems & a range of other allied construction accessories S-lon has made significant investments in research and development. Our R&D team is equipped with facilities to study formulations, creep properties of materials, accelerated ageing and other testing over and above what is normally required for Quality Assurance against published product standards. We consistently manufacture the highest quality products in the industry and are committed to ensuring ongoing excellence. 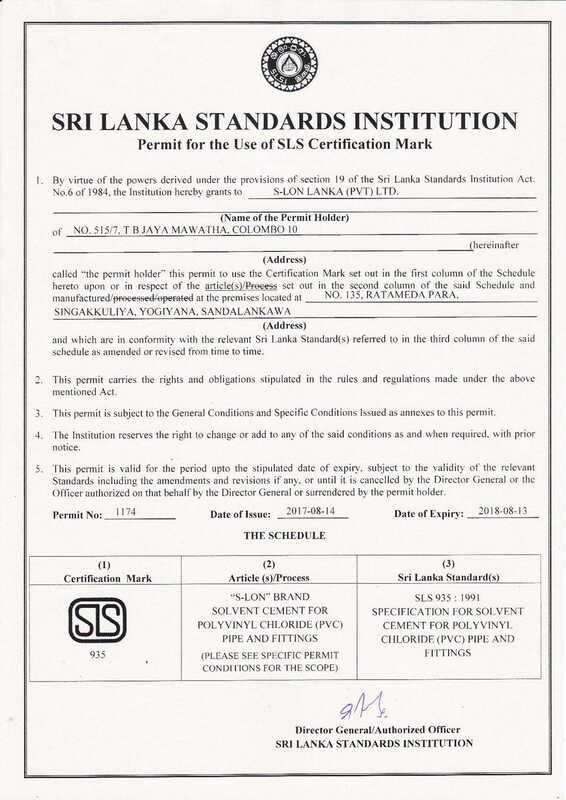 In keeping with our commitment to ensure durable and safe products to all our consumers, S-lon Lanka (Pvt) Ltd. maintains extremely high standards of quality by adhering to a culture of being uncompromising. The 11 acre facility is equipped with an exceptional physical testing laboratory which ensures that all products manufactured here undergo the most advanced quality control measures, during every step of the production process. 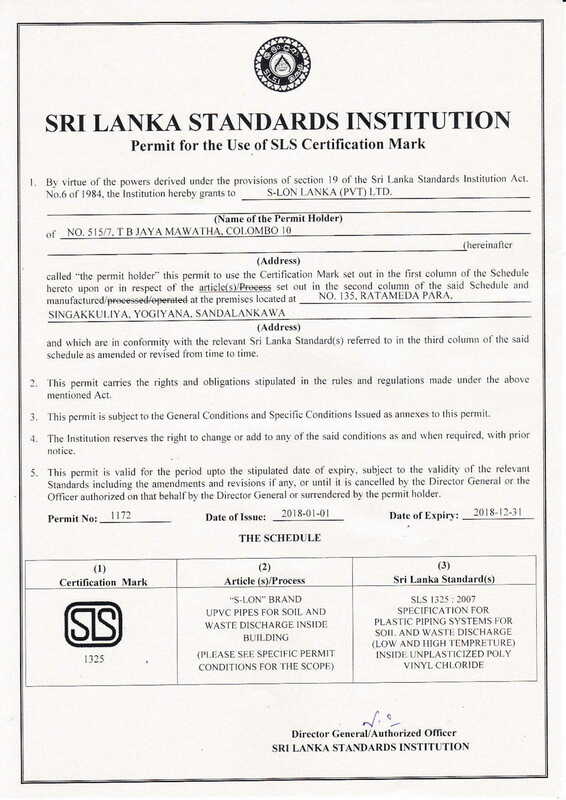 In fact, the Company’s Quality Management system has even been approved by both local and international quality systems governing bodies such as the BVQI, SGS, WRAS and SLSI, and has been awarded with the prestigious SLS ISO 9001:2008 certification - testaments by themselves. 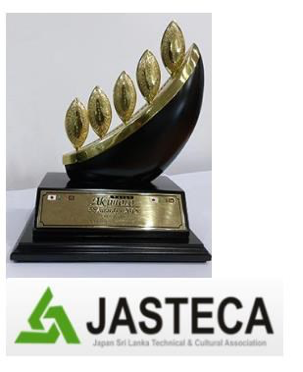 We maintain an effective and efficient quality management system which is certified with SLS ISO 9001:2008. The quality system is continually reviewed for effectiveness and continuous improvement. We have been pioneers in our sector for over 60 years and our second-to-none approval status proves our experience and quality commitment provides a winning combination. 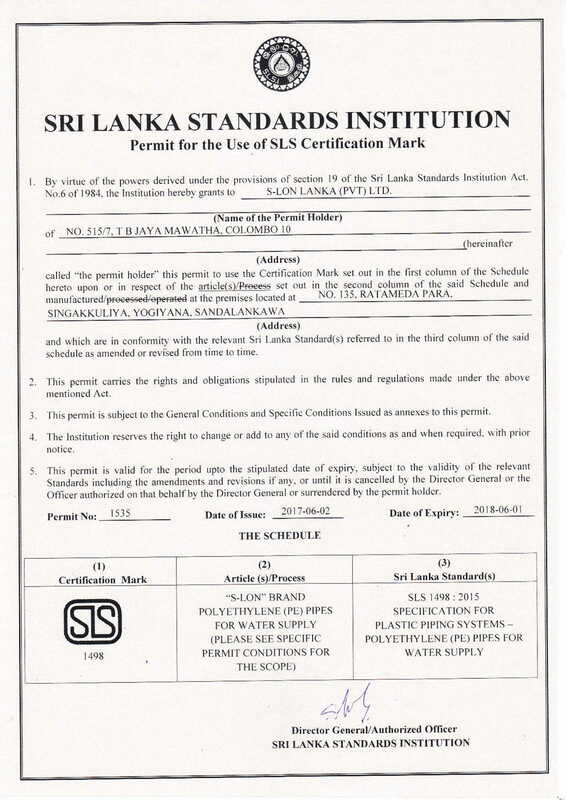 Our products meet all the relevant Sri Lankan as well as international industry specifications for Thermoplastic pipe industries. As pioneers in providing water management solutions, we have continuously driven innovation in the industry, constantly raising the bar for quality standards. 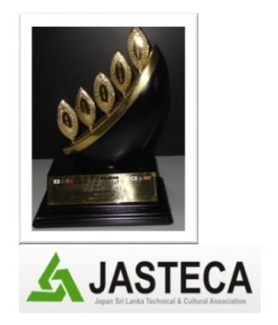 The recognition we have earned stands a testament and constitutes our vision of pursuing excellence and setting new industry benchmarks. We have been pioneers in our sector for over 60 years and our second-to-none approval status proves our experience and quality commitment provide a winning combination. 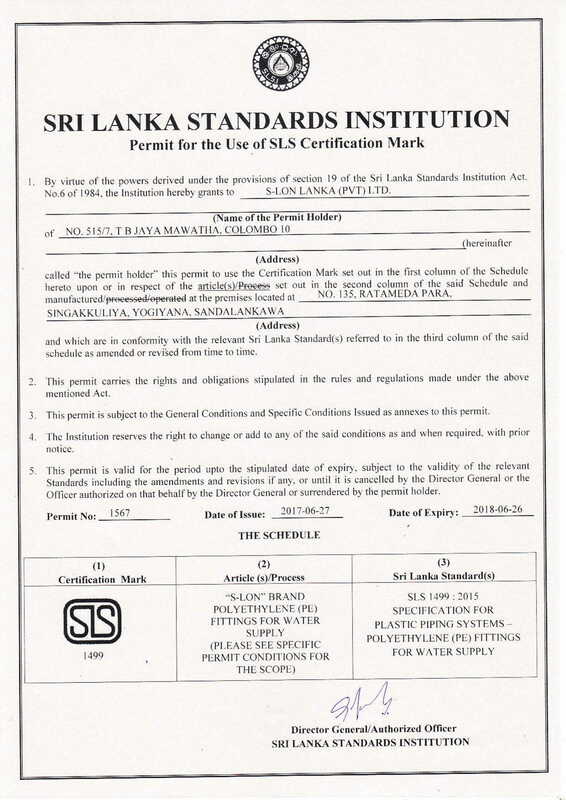 Our products meet all the relevant Sri Lankan and Continental industry specifications for Thermoplastic pipes industries alike. 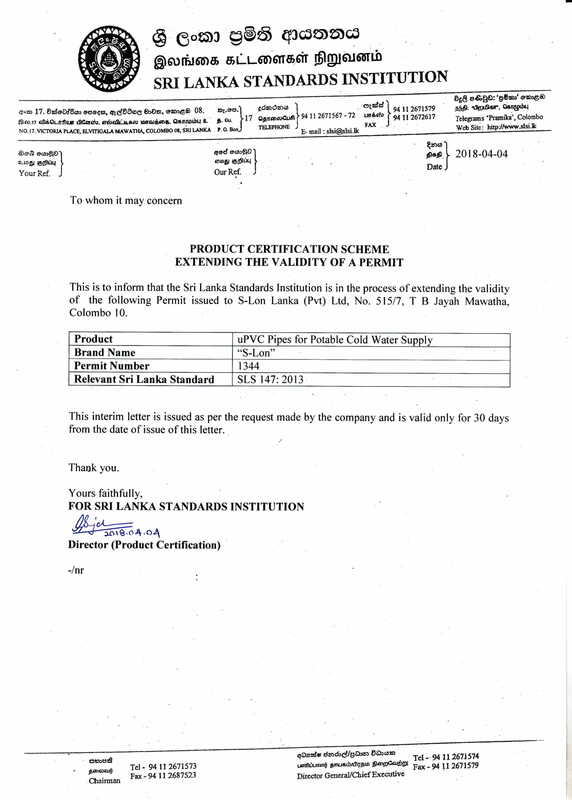 The Company manufactures uPVC pipes as per SLS 147 standard. 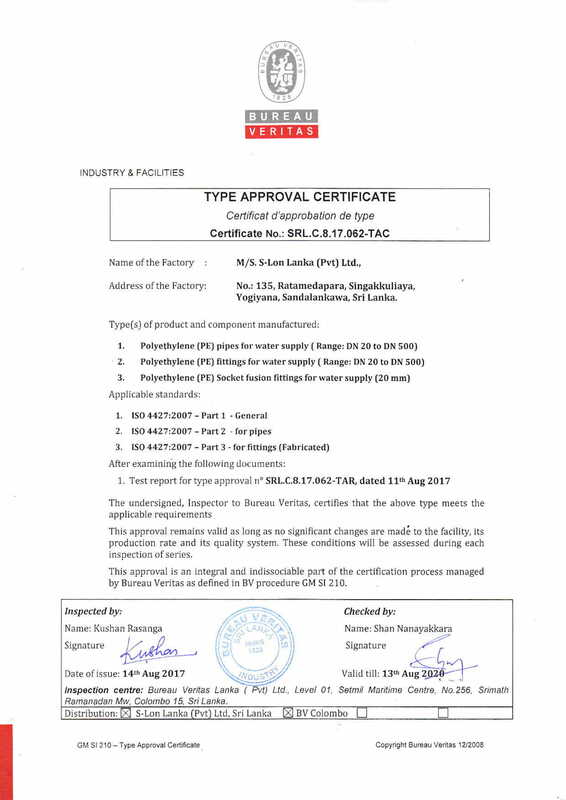 In fact the Company has obtained the latest SLS 147:2013 standard which is in line with ISO 1452, being the first company in the nation to do so. 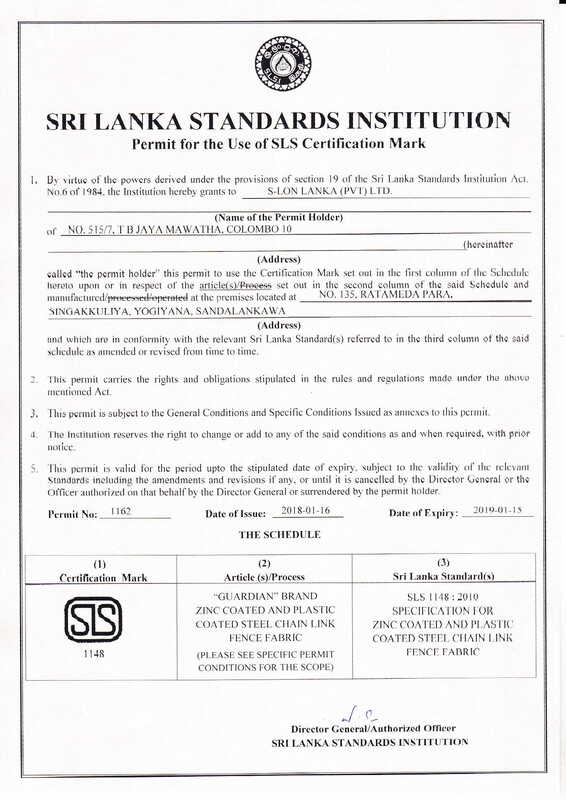 uPVC Solvent Cement conform to SLS 935 standard which is in line with ASTM D2564 Electrical Conduits conform to SLS 993 standard which is in line with IEC standards. 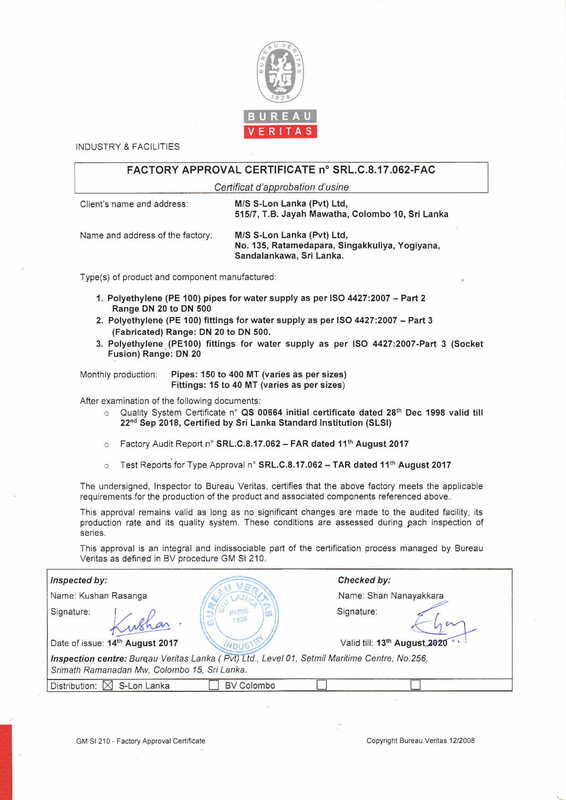 S-lon Lanka took leaps into excellence becoming the first and only manufacturer in Sri Lanka to be bestowed the prestigious SLS 147:2013 standard in recognition of excellence towards PVC pipes. 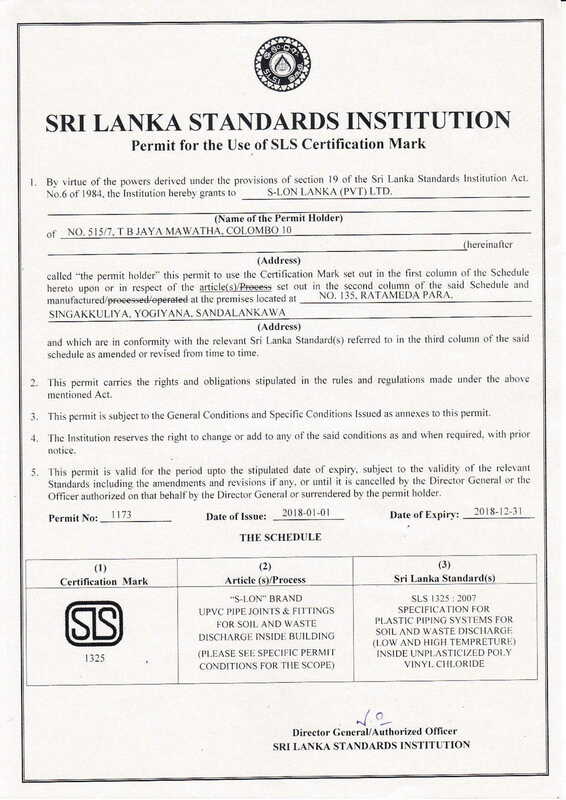 The SLS 147:2013 comes ahead of the existing SLS 147:1993 standard, being an award that acknowledges higher standards of safety, superior international testing standards and precision construction.